At the base of Kyoto’s western hills, Arashiyama and Sagano are most famous for their bamboo groves, which are spectacular (the most impressive grove is outside Tenryū-ji’s northern gate), but the area is also full of temples and gardens. 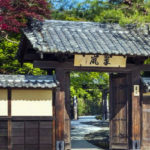 Although there are many temples to visit, we especially recommend Tenryu-ji, Jojakko-ji, Gio-ji and the Nenbutsuji temples, Adashino and Otagi. The Iwatayama Monkey Park can be found just south of the Togetsukyo Bridge. After hiking uphill for about ten minutes, visitors will find an open area with over a hundred monkeys roaming freely. There are also nice views down onto the city. Running the Hozu River rapids in a traditional boat is a wonderful way to take in some of Kyoto’s greener scenery. The ride takes about two hours, and boats leave every hour during the warmer seasons, so you won’t need a reservation. 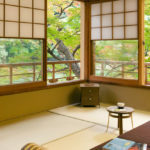 Simply make your way to JR Kameoka station: the boat trip is traditionally paired with a return on the romantic train – touristy, yes, but enjoyable and scenic all the same – if you do this you’ll need to change trains or take a bus from Torokko Kameoka Station. The river trip costs 3,900 yen per person.